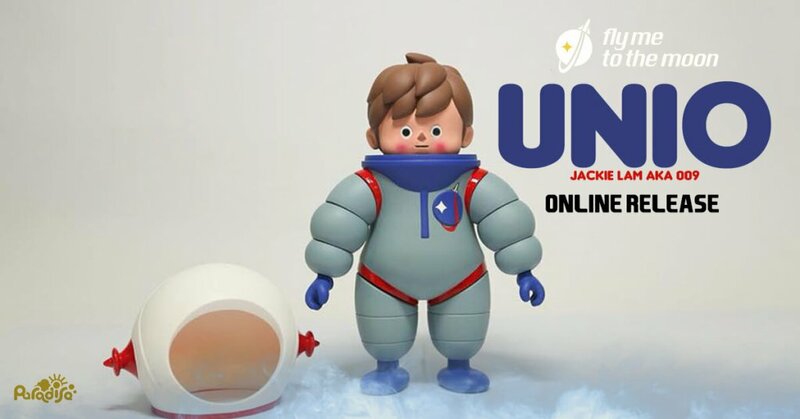 Jackie Lam AKA 009’s “Fly Me to the Moon” exhibition still going on at Paradise Toy Land many like ourselves have been asking if any of the prices especially Jackie’s “UNIO” toy is for sale for international collectors. Today the questions have been answered! and it’s a YES. As we’ve said previously. Hong Kong artist Jackie Lam AKA 009 who brought you the wonderful “The Sleepless Night figure TORRES” looks to jet set ready to launch a new figure from his illustrations. Powered by designer toy veterans “How2Work”, UNIO Lost in the space will be showcased at Jackie’s Solo “fly me to the Moon” show at Paradise this weekend. Jackie has already stated that UNIO will have a PARADISE SPECIAL Edition which you can check below. Jackie’s Solo “fly me to the Moon” show will also feature Jackies paintings and prints! Meet Jackie at Paradise in person, time to get that selfie pose ready. For overseas orders send us a message via Facebook or mail to “[email protected]“. The price shown excludes the shipping cost. We can offer AirMail or EMS as shipping option. PayPal could be acceptable as a payment option. All Paintings ordered will be shipped or being available for picking up in shop after 8/1(Thu.). Email [email protected] for any sales enquires from the show. You can find 009 on Facebook.